There is nothing better that the aroma of fresh baked bread filling up your kitchen and house, especially yeast risen breads. 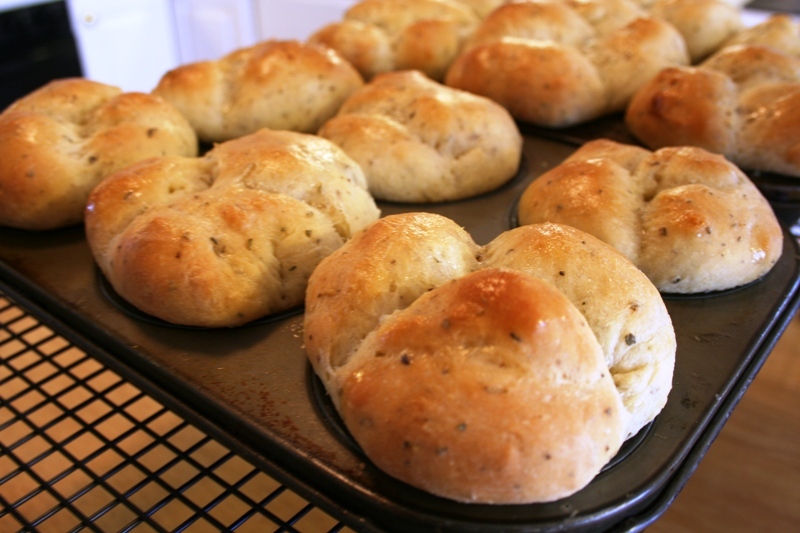 These herbed crusty cloverleaf rolls are just what I am taking about as they filled up our house with that fresh baked bread aroma all day. Walk out of the house for a few minutes and walk back in and the place smelled like an old French bakery indeed. Fresh from the garden herbs such as rosemary, thyme, basil, oregano, and marjoram chopped and blended into the flour and dry ingredients makes this a wonderful herbed roll. One-quarter cup of fresh herbs, or if no fresh are available use 2 tablespoons of dried herbs. This recipe is adapted from the National Home Gardening Club’s Garden Traditions Member Recipes book and found on page 69 in the “Breads” section. Doris Bjork of Newton, OK submitted the original recipe. Procedure Steps NOTE: Pre-heat oven to 170° F.
2. In the yeast mixture add the room temperature eggs, oil and garlic salt. Then mix in 3 cups of the flour and beat until smooth. 4. Punch down the dough. 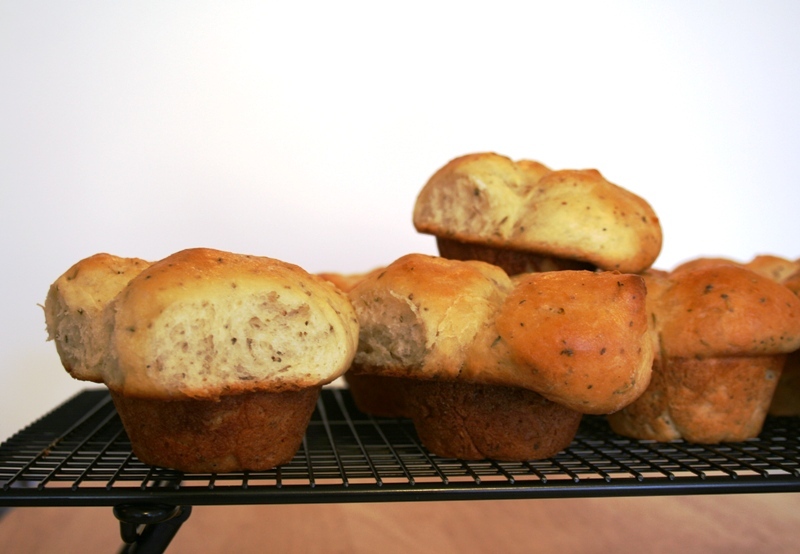 Grease 3 2×3-muffin tins. Pinch off inch sized balls of dough, turning edges under to middle to form a smooth ball. Place three balls in each cup of the muffin tips. Place back in the warm oven and let rise again until double in size, or about an hour. 5. Remove from oven and pre-heat oven to 350°F. Bake rolls until dark golden brown and when they sound hollow when tapped on the bottom with a fingernail. Brush with melted butter and cool on a wire rack. Variation: Bread Sticks, during the forming in step 4, try twisting the dough into braided sticks for herbed bread sticks. Pulling off larger pieces of dough, roll them into strings about eight to ten inches long, then braid three of them together. Bake at the same temperature until golden brown and butter, and cool on a wire rack as in the final step with the rolls. Serve the bread sticks with a warm marinara sauce. Tip 1: Typically, when working with yeast-raised dough’s there is always a fermentation time for the yeast. Yeast need fuel to grow, and the sugar and water gives them a great place to start their magic, dissolving the sugar in the water first, then adding the yeast gives them the energy they need to come alive. Once the yeast has foamed up and has a nice alcohol yeasty aroma, they are then ready to proceed with the next steps in adding ingredients. Tip 2: There is typically a rising or proofing time for the dough, and some yeast dough recipes will include two proofing times before the final forming or baking. For the professional kitchen or bakery there will be proofing boxes or warming ovens, which are set at a very low temperature between 140° F and 170° F. Just enough warmth to give the yeast a perfect growing location in a draft free environment, but not too hot to bake, not too cold to stop the yeast from working it’s little magic. For the home kitchen, typically, you can set the oven to a low temperature of 170° F or less, this can be used for the proofing stages. Once it is time to bake, temporally remove the items from the oven and pre-heat to the desired baking temperature, and then return the dough to the oven to bake. I love freshly baked bread! To me there’s nothing better than a piece of bread just out of the oven with butter! Oh these rolls are just gorgeous! Yum! These look amazing and one of my favorite rolls!! You are absolutely right! There is nothing better than fresh homemade bread. I bake regularly on weekends for our bread supply. It never fails to amaze me how wonderful the smell is of the bread fresh out of the oven. They look lovely! I’m going to make them this weekend. I made bread last weekend. This is the only time of year I bake quite a bit. As soon as spring arrives, that will be the end. I’ll be going for long walks by the river. Hope the snow melts soon! My goodness, I can smell those rolls already!! I totally agree that freshly bake breads is really delicious and its smells really good. Thanks for the Recipe! hmmmmm love the look of this and the smell must be wonderful! ooohhh! These sound wonderful. I wish I had these in my oven right now. i just love freshly baked bread especially when it’s still warm that’s when it tastes best! Awesome, let’s get the butter and cheese…. Your right – I love the smell of bread baking. I think that is about my favorite smell in the home….next to cinnamon rolls! How nice that you have fresh herbs in your garden! I feel the same way about bread. Btw, my chef instructor told us that when she bakes bread at home sometimes she’ll run the clothes dryer for a bit and use that as a proof box!